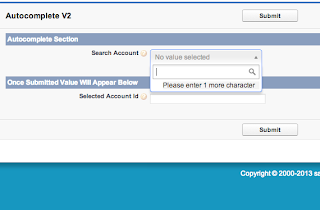 BlogForce9: Autocomplete Visualforce Component V2! Yes Its the V2! Well this one of the most required iteration of my Visualforce Autocomplete Component, which worked well with small data set but starts showing sluggishness with large number of records. After doing some debugging and I felt like the underlying architecture is the problem and needs to be rewritten. And finally while searching for a good JQuery component I came across the Select2 project which looked promising but was a lil but different and was more to do with Picklists. Hmm well gradually I started going deeper into the API and guess what ? I found a way to make it to a Autocomplete component!. The newer component looked pretty much good and was way faster than the earlier Jquery Autocomplete that I used in V1. The component no more depends on the Jquery from the package and can use jquery from Visualforce page(if already referred in page). Configurable : The search field can be configured to search fields other than "Name" field. 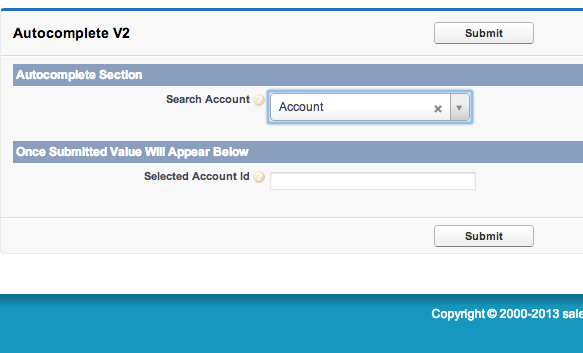 Even the value that is returned to controller can be configured return fields other than record Id. labelField : The field which is displayed in the component and against which matching is done with the entered text. In above code snippet Name is displayed in the autocomplete component. valueField : The field value which is passed back to targetfield when a record is selected. targetField : The field from controller where the selected values is set. SObject : The sobject Api Name against which matching/query is done. importJquery : Assign false if you dont want to jquery files from package. Where can this be used ? 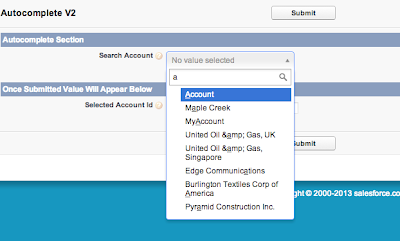 It can be used for replacing Lookups and Master Detail fields. Instead of pressing the lookup button user can directly type in the autocomplete field to search and link the right record. A great update - thanks so much for this version and the previous. I've just incorporated into my VF page, but it looks like it doesn't work (the component renders as a normal standard inputText) if sidebar="true". Why does sidebar have to be turned off? Anyways, thanks again! it should work. Do you have any sidebar component that uses jQuery ? I'm getting similar results with the sidebar on, were you able to resolve your issue Peter? If so, how? Thanks. Hi Dave, do you have anything in your side bar that uses Jquery ? I tried this on my org works perfectly with the sidebar. 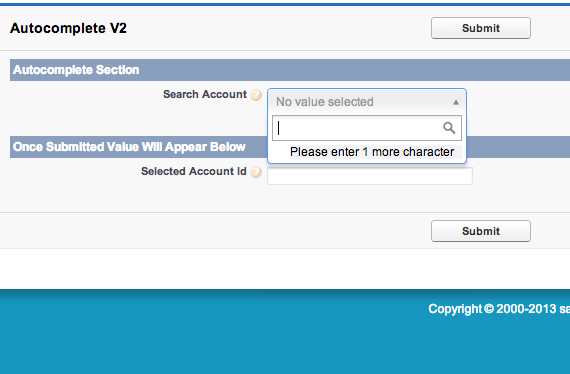 I tried this AutoComplete V2 component and it works great if I choose an existing value. But if I enter a text that doesn't exist already in the object field, the component immediately clears the input field, the moment I move to the next field. The documentation says if "syncManualEntry' is set to true, it should take the manually entered value - but it doesn't. Any idea on how to fix this? I'd also be interested in the "syncManualEntry" functionality. This would solve quite a few problems for us if it worked. Hi, Any work going on related to this package? Get installation failure message! An other one worked perfectly! Well do you have any older version installed in your org ? If yes I guess you have to uninstall that version and then try installing the newer version. By the way I just tried installing it in my dev org, no failures and was able to instal it. Sorry. Org limitation. Installed in other org and all seems fine. Thanks for all the effort to post this here! Great! I'm struggling to merge two of your solution. I would like to achieve that based on a user autocomplete lookup, I get the related object records back based on the user id. ohh well never thought of this ! can you share a glimpse of your VF Page as well ? I have send it directly, This box doesn't allow me to upload or so!! Yes some help would be nice! Probably helpfull for others also! Hi and thanks for a great component! I am working on getting it on a visualforce page of mine and it looks very nice there. One question though. Can you pass a parameter into the search? I am using it to look up contacts and in some cases I would like to limit the search to contacts of a certain account. well sadly this is something that needs a code change and I am considering this for my next release. I will be updating the same soon. I am getting the following error when using my own custom object with this control, code and error below. is the labelField and valueField the API names or the "Field Label" names? Invalid Field/Object API Name: line 97, column 1: sObject type ‘MyObject__c’ is not supported. If you are attempting to use a custom object, be sure to append the ‘__c’ after the entity name. Please reference your WSDL or the describe call for the appropriate names. Well scot the labelField is the field API of the field that you want to show as label (options / dropdown values) in the autocomplete and valueField is the API name of the field you want to capture in targetField. Ok, that fixed it, thanks. Also, I have found when using the auto complete component with the blocking UI component the auto complete won't release the UI, it stays blocked. I have to comment out the block below on my page when using the auto complete component. The reason why the importJQuery is false, I am also using the PageBlockTableEnhancerADV component of the page. can you give a glimpse of the code ? Aninava, I sent you an email with the code example. All I did was change the autocomplete demo and placed the UI Block Component at the top of the VF page. Did you get the email and do you have a solution or work around for the problem? Just checking did you get the email with the VF code? I understand, thanks for looking into the issue. I 'm using your very nice autocomplete v2 - really a nice component. But I have a problem when this is in a VF page and in a section that is refreshed (rerender). The component isn't working and you only see a text box. Is there something that I need to do so that the components keeps on working? Hi Bart, I am really glad that you liked it. By the way did you check the demo page ? The demo page also has a "Submit" button that rerenders the section in which the component resides. Did you implement the component in the same way ? I am wondering if JQuery NoConflict would help collision with other sidebar components. Sidebars jQuery hacks are going away...but I have one running in the meantime and Autocomplete won't work with it enabled. Any headway on this? I am using AutoComplete V2 component with some modifications. I added 2 more parameters to it. First is 'extraSOQLCondition' which is used to pass a string of SOQL condition which is used to filter the record. For example, I wanted to search only accounts of certain recordtype. Second is 'OnChange', which is basically an onchange event that can be used by container of the component. 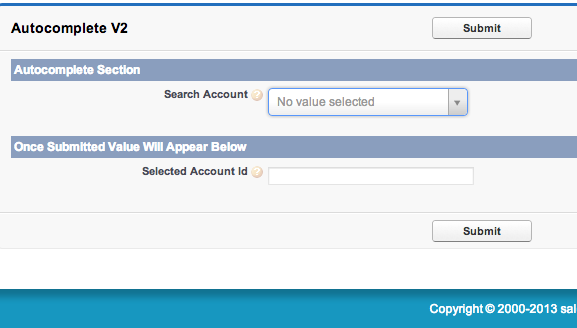 If I select this account, the component shows blank value on the page. Can you help me find out where should this issue be fixed? Type mismatch for <apex:attribute assignTo>. Value binding to a property of type ANY is required, property specified (targetFieldVar) is of type Object. Do you recall how you resolved this? I think I just answered my own question. I changed the Type on the targetField attribute from Object to sObject. This seems to work. Thanks for this useful component. I'm getting this same error as well, and I've tried to mimic the same setup as used in the demo, but still no luck. Any ideas? I saw that Varun Rathi said he modified your code with an "onchange" event with your tool. I would like to use an onchange event too. When a user selects a value it triggers the "onchange" event which allows an action method to execute in lieu of using the "Submit" button like you have in your example. I am unsure how to accomplish this using a component. Did you get fix for onchange event? if so,could you please share the details? 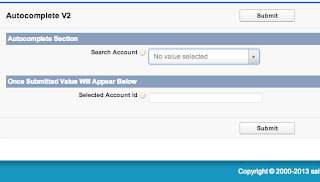 Duplicate Name The name "AllDemoLink" is already used on component type: Visualforce Component. Please rename existing component. Ok ... to prevent this error I renamed 'Alldemolink' component in prev. utility and installed Autocomplete successfully. I came through the requirement where lablefield and valuefield should be same. however, with your component labelfield and valuefield cannot be same. hope you would update that part too. Any idea how to get rid of this error message? I think you can try to make the autocomplete_con controller method and class global ? Can u please let me know wht is this issue with this, my app is completely broken bcoz of this bug. is it bcoz of of java script not loaded ? i am not able to debug the issue on the ipad, just check with u wht might be the reason. Similar issue happening to my VF Page Redirection. Please suggest a way out here. Did you get any workaround for this? Can we concatenate account phone with existinbg account name in search field? Hi I am using the component and it is gr8 component i can say. Can any on help me to rerender on onchange as soon as secte he accont name rather than one more button . Hi This is really great. I am using this in force.com sites and component is not returning any results. It works fine when we access internally. So should be permission issue and I tired all ways. Can you pls guide me? how to specify multiple field names in the 'labelField' parameter of component if i want the search term to be searched among multiple fields? Does anyone have the code for the "onchange" event? Avinava, could you add this to the main component? Also, how do we remove the & ' type characters from the display text? On rerender autocomplete component turning into textbox with no error found in Inspect, fingers crossed can someone help me here? I Want to get the same value what i am selecting from auto completion .But i am getting value as " id ". If i change the value as "valuefield" as "from1__c" . Then it is showing error as duplicate field i cant able to select value . ell sorry for late reply, have been busy with work. I am sorry to say this, but the onchange functionality in not working. Can you please fix it..
Well sorry for late reply, have been busy with work. I am using this and it's working but when i search first option show as searched String not a record , i tried to remove but not found any way to remove it? can anyone help me ? 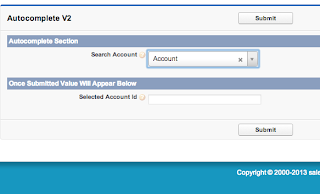 Your component is really good and works well on desktop version of visualforce pages. I tried the same on mobile version visualforce page (using jquery mobile) and its not working. I am not able to enter any text in the autocomplete text box through SF1. Do you know how to make this working? Thanks in advance. If the field already has a value, this component doesn’t display it. Can you please let me know how to get a existing value in the lookup component.